In my seemingly endless quest for self-video glorification, I have uploaded another few seconds of me and my Tommy. 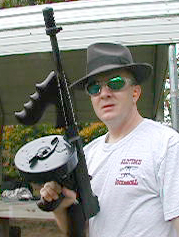 This time, you guessed it, it's another fifty rounds blazing from the muzzle of my Westy 1928--with a 21 actuator. The video is about 5 megabytes, and does require the www.quicktime.com plug in. Today I finally managed some free time. That, coupled with a few hundred rounds, led to some fun. My main purpose was to test fire Michael's (aka Norm) C drum. More about that later. Anyway, for those who love to see the Thompson in action, here ya go. Rust : You are one sick puppy! You obviously have WAY too much time on your hands, wish I could say the same. ROCK ON! Chris, you take this trooper thing way to serious! At least a smile after you put 50 into that car that wouldn't stop. So, I think the thing that just "makes" this vignette is the punctuation at the end provided by the casual locking-back of the bolt, which seems to occur almost as an afterthought. Consequently, I'd give this production a two thumbs up. Your scaring me with that hat! I like the hat! I also like the gun! I've got to go shooting this week-end! I'm having withdraws. Brickyard, you up for burning a few hundred rounds? But! Remember if you live in "Cubeland" at work and forget to turn down the sound (as I did), you WILL draw a crowd! Mike: Sure, I'd go for that! Sunday would be better for me but either day would be fine. I'll be off line till late in the day Friday so, drop me a note and I'll catch it when I get in. Video test: I'm working on the problems now .... I think I've got it figured out. Can a couple of you give me some feedback. Email is fine. Thanks. Now I've heard it all. Blaming your Thompson's performance on Microsoft Windows! Both videos are great. I wish my 27A1 could do that! Guess I should have bought an iThompson or a MacTommy. Then I would have never worried about jams, etc.! Maybe we can get a good pumpkin explosion on Saturday! Say 3-4 Thompson's blasting one evil pumkin charging us. You know, the are evil after all. We could put a towel or turbin on it, and it would be justified wouldn't it? As I have said, "kill them all and let the Great Pumpkin sort them out!" Make sure it's a pre-ban pumpkin! So what am I doing wrong? My video looks like I have no control at all, though I hit the target ( a cooler in this case). I try to do all the things I think I am supposed to, but still feel like it shoot me.